The sliding of a solid body in contact with another solid body is always opposed by force of friction. 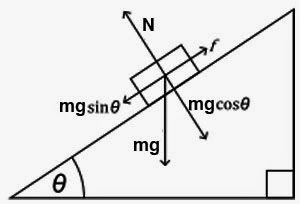 Friction acts in the direction opposite to that of relative motion and it is tangential to the surface of two bodies at the point of contact. Friction is a necessary on every machine because it involves wearing of the machine component and consumes energy that transfers into heat. In come cases friction is desirable in the case for the functioning of a machine, such as belt drives, friction clutches. When a body is moving, the friction is directly proportional to normal force and frictional force direction is perpendicular to the normal force. Friction doesn’t depend on the area of contact so long as there is an area of contact. The coefficient of static friction is slightly higher the value than the coefficient of kinetic friction. Kinetic friction is independent of the velocity of the body. Friction depends on the type of the surfaces in contact. It is very useful however I would appreciate it if you could explain those laws in simple English.